Bear Grylls Survival Knife Review: It’s Worth your Money? Home » Knife Reviews » Bear Grylls Survival Knife Review: It’s Worth your Money? When it comes to choosing a survival knife that will perform in the direst of situations, there’s more than enough debate to be found. From the steel to the handle material to the shape, thickness, and grind of the blade itself – every facet of the “perfect” survival knife has been discussed at length for decades now. Still, when an expert weighs in – people tend to listen. Bear Grylls has become a household name for his survival TV show, Man vs. Wild, but his pedigree is actually quite legitimate. A survival instructor and former SAS serviceman, this is a many who knows what he’s talking about when it comes to preparedness. In the following article, we’ll be looking at Mr. Grylls’ signature knife, the Gerber Bear Grylls Survival Knife, to see if it deserves as much respect as the man himself. This knife is perfect for newcomers to camping, survival, or to knives in general. It’s high quality enough to hold up to a lot of punishment, accessible thanks to the branding and celebrity tie-in, and affordable enough to not ruin anyone’s budget if something does end up going wrong. Not too big or too small. Serrated edges are not great for batoning wood. Versatile design with a partially serrated edge and drop point blade. Rubber on the handle can rip over time. Attached lanyard cord and included military-grade nylon sheath for multiple carry options. Complaints about QC and version control on this model. Stainless steel will provide great edge retention and corrosion-resistance. Holes in the handle allow it to be used as a “spearhead” when attached to a stick. As I’ve mentioned many times before, if you want to properly evaluate a survival knife, you’ve absolutely got to take some special factors into consideration. This is because – as great as a knife may be – if it doesn’t meet certain specifications that will allow it to serve you best in a survival situation, then it might as well be a spoon. In the following section, I’ll discuss a few things you need to take into account before you consider buying the Gerber Bear Grylls Survival Knife. Blade Size – The size of a survival knife will drastically affect what it can do. On the one hand, a heavy, large-bladed knife will be great for chopping wood and other heavy-duty tasks, but be less suited to more precise, delicate jobs. Your Location – Your geographical location will be a large factor in your choice of a survival knife. If a life or death situation were to occur, where would you be? Would it be hot, cold, wet, or dry? Would you need a blade you can conceal or something that can hack through acres of woods? Steel Type – Sure, there’s nothing quite like cold steel in an expert hand – but what kind of steel is right? Depending on your answers to the other questions on this list, you may find that the perfect steel type for your neighbor’s needs may cause you nothing but frustration, and vice versa. Suitable for EDC – While some survivalists and preppers wouldn’t think twice about walking around all day with a machete on their hip, others can’t be so bold. If EDC or concealment is something you want in a survival knife, you’re going to want to scale it down a bit. Weight – Weight won’t just determine whether you can carry your knife around easily, but also what jobs it can do. Batoning wood and hacking underbrush require a bit of heft, but lugging that heft around will also tire you out quite quickly. 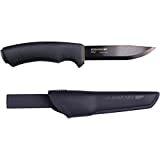 Accessories – Some survival knives are designed with accessories in mind. These can include literally anything, from special sheaths to ferro rods for starting fires in the bush. If these items matter to you, then what comes with your knife is worth considering. If you were to exclude the celebrity marketing tie-in and merely evaluate the Bear Grylls Survival Knife on its own merits, you would see that it is a fairly-priced, versatile tool from a well-trusted manufacturer of just those types of blades. A 10” and 11.2 oz. in weight, this is is by no means a small knife, but it is certainly much more manageable than much of the competition, which can range up to 14” and weigh in excess of 1 lb. Gerber’s choice of steel, 7C17MoV stainless, may be popular for so-called “budget” knives, but it also provides great wear resistance and overall strength while being naturally corrosion-resistant. First and foremost, it’s important that we understand that this is not an expensive knife. For those of you with unlimited budgets, it’s easy to write off anything under $100 as “junk,” but everybody – regardless of income – deserves a chance to survive, and this knife helps make sure of that. That being said, as survival knives go, the Gerber Bear Grylls might have some problems meeting every outdoorsman’s needs. To better hone in on exactly what type of user can benefit the most from this knife, we’ll have to take a closer look at its design. The 4.75” blade of the Gerber Bear Grylls Survival Knife is about as solid a design as one can ask for at this price point, but that hasn’t kept it completely free of controversy. The drop-point design is – in my opinion – a great choice, which is why you see it so often on survival knives. It will cut, pierce, hack, and slash quite well, but not be so large or cumbersome as to prevent more detailed work. A big sticking point is the serrations. Now, there are plenty of uses for a serrated knife in a survival situation, but the addition of the teeth can make the knife both hard to sharpen in a pinch and hard to use for batoning wood. Other than this design feature, the blade features great tip support, a striking point for a ferro rod, and – depending on who you ask – full-tang to 7/8 tang construction. With plenty of piercing support, the aforementioned striking point, and options for both flat and serrated use, it’s fair to say that the people at Gerber thought of virtually everything when designing the Bear Grylls Survival Knife. However, as we mentioned, this is not going to baton wood as well as most survivalists would hope. So, either you use the money you save on this knife to buy an axe, or you take a bit longer preparing the fire while the serrated teeth catch now and again. All that being said, this is a drop-point knife with nearly 5” of cutting surface and a tough, thick blade design that goes right through the handle and into the pommel. It’s as good a design as it can be for the price, size, and weight of this knife. 7C17MoV Stainless Steel, for those who are unfamiliar, is a specially-modified variation of 440 A stainless, containing more vanadium than most other steels. In layman’s terms, this high vanadium content leads to more overall strength, increased wear resistance, and increased toughness while also allowing the blade to hold an edge much longer than other 440 A knives. In my opinion, all of those qualities are on my checklist for a survival knife. Combine this with the fact that stainless steel is naturally corrosion and rust resistant, and you have the makings of a pretty reliable blade. In a survival situation, being able to hold onto your knife could mean the difference between life and death. In the case of the Gerber Bear Grylls Survival Knife, the manufacturer has offered us a handle made of hard, injection molded plastic that is covered in a thick layer of rubberized coating. By all accounts, this coating not only offers a reliable, no-slip grip in all conditions, but it is also quite comfortable and helps keep the user from tiring. Even so, the rubber will eventually loosen or rip over time. This could take years or months depending on use, but it is something that needs to be considered, as the plastic underneath will not make for a very secure grip. The lanyard is a nice tough (as they are usually not included), and I’m a huge fan of the holes that allow the knife to be secured to a stick and used as a spear. Very clever. The less-than-enthusiastic rating, however, comes from the fact that some of the models of this knife currently circulating are not full-tang, but instead, have the pommel “attached” to the blade several centimeters into the handle. In a lot of cases, these pommels have fallen off. While the manufacturer now produces a full-tang version exclusively, those who attempt to buy this knife used are still in danger of getting burned. It’s obvious that Gerber has gone out of their way to pair the Bear Grylls Survival Knife with a sheath that fits the brand. Not only does it include a sharpener and fire starter, but it also comes with a small “instruction booklet” that covers some basic survival situations. Gimmicks – worthwhile as they may be – aside, the sheath is military-grade nylon, features a clip that secures the knife in place without the strap, and is perfectly suited to multi-position carry, including upside down. It’s not going to win any awards for beauty or function, but it should have no problem making most users happy. Despite its relatively controversial standing in the knife world, rating each component of the Bear Grylls Survival Knife reveals a reliable, well-designed tool that – save a few quality-control errors that the manufacturer has already fixed – should hold up well to whatever urban or rural environments have to throw at it. Still, the serrations may not be a strong selling point for every user, and in the future, Gerber may consider moving them to the back near the handle to ensure those who want to baton wood can do so unrestricted. The handle remains problematic as well, as I just can’t shake the image of that knife handle sliding right out of the rubber coating and landing who-knows-where. The nylon sheath is fully mildew resistant, so wet weather shouldn’t be a problem. The serrated edge is perfect for cutting seat belts and other man-made materials quickly, making this a great search and rescue knife. This particular steel is known for its excellent edge retention, and it can be rather easily sharpened with small tools designed specifically for serrations. There are alternatives to the Gerber Bear Grylls Survival Knife if you want to check out other options. Here is a look at some of the best ones. Morakniv is a highly-regarded Swedish knife manufacturer that produces medium-to-high price range blades that are reliable, innovative, and quite visually stunning. Depending on your source, the Bushcraft Carbon Fixed Blade Knife may cost a bit more than the Gerber Bear Grylls, but – as you’ll see – it is a fairly good alternative. At 9.1” overall, and boasting a 4.3” blade, the Morakniv is roughly comparable in size to the Gerber. It has a high-friction rubber grip, a thickness of .125”, and the spine of the blade can be used with a ferro rod to start a fire. Where it differs, however, is in the lack of serrations – making it better for batoning – and the carbon steel blade, which is coated in anti-corrosive tungsten DLC and built to withstand a lot of stress. Carbon steel blade with tungsten DLC anti-corrosive coating. 4.3” long, 9.1” overall, and a 0.125 thick blade. Firestarter can be used on the spine of the blade. Swedish made – good and reliable. For those not familiar with the Bubba Blade family, they specialize in low-to-medium priced outdoor knives, with a particular focus on hunting and fishing. This focus, of course, does not render them useless as survival knives, as providing food is a large part of what hard-core survivalists need to do on a daily basis. The blade features a super-thin 8Cr13MoV blade which is coated in Ti-Nitride for extended rust resistance. The thinness of the 6” blade makes it great for detailed work like skinning and filleting but may cause it to bend if put under too much duress from batoning or piercing. For those who love the serrations of the Gerber Bear Grylls, the Bubba Blade has them, they’re just located on the spine, leaving you with a choice between a nice smooth, sharp blade or a sawback depending on the job. Deep finger choil with a mossy camo look on the non-slip handle. 11” overall length with a thin, 6” blade. “Sawback” design – serrations are on one side, flat blade on the other. 8Cr13MoV blade with Ti-Nitride coating for rust resistance. For those who want a survival knife with all the bells and whistles of the Gerber, but who are on a tighter budget, the DAX Survival Knife presents an ultra-affordable and quite reliable option. While this is certainly priced in the “Walmart Blade” range, it is nothing but. Featuring full-tang, 420 stainless steel, a sawback design to keep those who want a serrated edge happy, and an overall length of 8”, this is a fairly comparable alternative to the Gerber. It also features a fire starter and whistle, but its most unique innovation is the handle. Made from tightly wound paracord, the handle can be disassembled and reassembled when a long piece of durable rope is needed. Very unique. Ultra-affordable and durable full-tang construction. Reliable 420 stainless steel will resist rust and corrosion. As I mentioned before, the Gerber Bear Grylls Survival Knife has proved to be quite the conversation starter around the knife world, as any product with a celebrity tie-in usually does. However, while it is certainly without problems, under scrutiny, you can see that this is a fairly reliable and useful knife, especially considering its price point. If survival is the name of the game (and it is), then it’s fair to say that this knife will, if treated well, perform well under most circumstances. For those who need a “jack of all trades” knife for their car or cabin, or if you’re a newcomer to camping or survival, or if you’re just a fan of Bear Grylls, this should prove a perfectly reasonable investment. For more details on the Gerber Bear Grylls Survival Knife click the link below.